Brigit was one of the great Triple Goddesses of the Celtic people. She appeared as Brigit to the Irish, Brigantia in Northern England, Bride in Scotland, and Brigandu in Brittany. Many legends are told about Brigit. Some say that there are three Brigits : one sister in charge of poetry and inspiration who invented the Ogham alphabet, one in charge of healing and midwifery, and the third in charge of the hearth fire, smithies and other crafts. This catually indicates the seperate aspects of her Threefold nature and is a neat division of labor for a hard-working goddess. Athena. As a warrior Goddess, She favored the use of the spear or the arrow. Indeed, various interpetations of her name exist including, "Bright Arrow," "The Bright One," "the Powerful One" and "The High One," depending upon the region and the dialect. Brigit is clearly the best example of the survival of a Goddess into Christian times. She was canonized by the Catholic church as St. Brigit and various origins are given to this saint. The most popular folktale is that She was midwife to the Virgin Mary, and thus was always invoked by women in labor. The more official story was that She was a Druid's daughter who predicted the coming of Christianity and then was baptized by St. Patrick. She became a nun and later an abbess who founded the Abbey at Kildare. The Christian Brigit was said to have had the power to appoint the bishops of her area, a strange role for an abbess, made stranger by her requirement that her bishops also be practicing goldsmiths. 18th century, the ancient song was sung to her : "Brigit, excellent woman, sudden flame, may the bright fiery sun take us to the lasting kingdom." 6rdered the sacred flame to be extinguished. Even then, She remained the most popular Irish saint along with Patrick. In the 1960's, under Vatican II modernization, it was declared that there was insufficient proof of Brigit's sanctity or even of her historical existence, and so the Church's gradual pogrom against Brigit was successful at last and She was thus decanonized. It is very difficult to obtain images or even holy cards of ST. Brigit outside of Ireland anymore. Clean your hearth thoroughly in the morning and lay a fire without kindling it, then make yourself a "Bed for Brigid" and place it near the hearth. The bed can be a small basket with covers and tiny pillow added as plain or fancy as you like. If you have no hearth, you can use the stove and put the bed behind it. Then at sundown light a candle rubbed with rosemary oil and invite Brigit into your home and into her bed; use the candle to kindle your hearthfire if possible. Make your own poem to invite Her or use the ancient song mentioned earlier. Let the candle burn at least all night in a safe place. You might even want to begin the custom of keeping the eternal flame; it is a popular custom in some magickal and Wiccan traditions. After all, it's up to us now to keep the spirit of Brigit alive and well for the next thousand years at least! I don't know any books that deal specifically with Brighidh, but please look for a book called "Celtic Mythology" by Proinsias MacCana and for "Gods and Heroes of the Celts" by Marie Lousie Sjoestadt for more information about Celtic deities. They are both VERY good sources. "Season of the lambs" and the comming of spring. Brigit overcomes the control of the Cailleach Bheur. BEREHYNIA is the Ukranian Goddess of protection. While some argue that she is a recent invention, made up to personify the new independence of Ukranian women, her symbols have been used for centuries in "pysanky" (egg-decorating) and "rushnyky" (embroidery of ritual cloth). Her form, a woman with her arms raised, has been modified through the centuries but has remained a symbol of protection. THE STORY OF BRIGHID IS A LINK BETWEEN THE PAGAN WORLD AND THE CHRISTIAN WORLD. IN PRE-CHRISTIAN TIMES, "BRIGHID "WAS A POWERFUL GODDESS WHO REPRESENTED THE MANY ASPECTS OF THE CELTIC SPIRITUAL TRADITION. SHE WAS THE DAUGHTER OF THE ONE THEY CALLED THE GOOD GOD, THE "DAGDA" OF THE "TUATHA DE DANANN"; HER NAME MEANS "'THE EXALTED ONE'". ORIGINALLY A SUN AND FIRE GODDESS, SHE WAS THE IRISH GODDESS OF THE SACRED FLAME, A THREEFOLD GODDESS WHO RULED OVER POETRY, HEALING, AND SMITH CRAFT. SHE WAS THE GUARDIAN MOTHER OF NEW LIFE, THE KEEPER OF THE WELLS, AND THE PROTECTOR OF THE LAND. FARM ANIMALS AND MILK WERE ESPECIALLY SACRED TO HER. SHE WAS SO BELOVED IN HER NATIVE IRELAND THAT THE PEOPLE WOULD NOT GIVE HER UP SO THE CHRISTIANS, UNABLE TO OBLITERATE THE GODDESS, TURNED HER INTO "ST. BRIGIT OF KILDARE" RATHER THAN TO TRY TO OUTLAW HER WORSHIP ALTOGETHER. THE SAINT THEN TOOK ON MANY OF THE POWERS OF THE GODDESS, PARTICULARLY HER FERTILITY SYMBOLISM. AS A SAINT, SHE HAD THE POWER TO APPOINT BISHOPS, AND THEY HAD TO BE GOLDSMITHS. SHE WAS ASSOCIATED WITH MIRACLES AND FERTILITY. THUS, THE TWO ARE SO INTERWOVEN THAT IT IS HARD TO SEPARATE THEM. IN SOME OF HER MANY LEGENDS, SHE WAS REGARDED AS THE "'FOSTER MOTHER'" OF CHRIST OR THAT SHE WAS A MIDWIFE AT HIS BIRTH. SHE WAS SHE IS DEFINITELY A SURVIVOR. SHE HAD AN EXTENSIVE FEMALE PRIESTHOOD AT KILDARE, A FORMER PAGAN SHRINE WHERE A SACRED FIRE WAS KEPT PERPETUALLY BURNING. IT IS SAID THAT IN THE SACRED WORSHIP OF "BRIGHID", THE VESTALS THAT ATTENDED HER WERE 19 IN NUMBER, THUS REPRESENTING THE 19 YEAR CYCLE OF THE CELTIC GREAT YEAR. THEY GUARDED HER SHRINE, HOWEVER, IN A CYCLE OF TWENTY NIGHTS,AND IT WAS THEIR TASK TO SEE THAT HER SACRED FIRE WAS NEVER SUFFERED TO DIE AWAY. WHEN IT CAME TO THE EVENING OF THE TWENTIETH NIGHT,THE NINETEENTH VIRGIN PILED WOOD UPON THE FIRE, DECLARING BRAVELY TO THE GODDESS: " BRIGHID, NOW TAKE YOU CARE OF YOUR OWN FIRE; FOR SURELY THIS NIGHT'S CHARGE IS AT YOU." FOR OVER A THOUSAND YEARS, THE SACRED FLAME WAS TENDED BY NUNS, AND NO ONE KNOWS HOW LONG BEFORE THAT IT HAD BEEN TENDED BY THE PRIESTESSES UNTIL 1220 CE WHEN A BISHOP BECAME ANGERED BY THE NO-MALES POLICY OF THE ABBEY OF "ST. BRIGIT;" HE INSISTED THAT THE NUNS WERE SUBORDINATE TO THE PRIESTS, AND, THUS, THEY MUST OPEN THEIR ABBEY AND SUBMIT THEMSELVES TO INSPECTION BY A PRIEST. WHEN THEY REFUSED AND ASKED FOR ANOTHER ABBESS OR OTHER FEMALE OFFICIAL TO PERFORM ANY INSPECTIONS, THE BISHOP BECAME SO ANGRY WITH THEM THAT HE DECREED THAT THE KEEPING OF THE ETERNAL FLAME WAS A PAGAN CUSTOM AND ORDERED THE SACRED FLAME TO BE EXTINGUISHED. SAO CH'ING NIANG NIANG is the Chinese Goddess of good weather. Also known as the BROOM LADY, she lives on the Broom Star, Sao Chou, and sweeps the clouds. She sweeps them in when rain is needed and out when it is not. 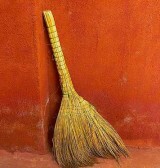 Farmers often hang pictures of brooms on their fences when in need of Sao Ch'ing's services. Her name, which literally means "broom Goddess," is also seen as SAO CH'ING NIANG, SAOQING NIANG, SAOQUING NIANG, and SAO-TS'ING NIANG.